Choeng Mon sits in the northern region of Samui, nestled in between Chaweng and Mae Nam. It’s made up of several stretches of white sand coasts that are thankfully neither overcrowded nor overdeveloped. The vibes here are quiet and laid back, which explains Choeng Mon’s appeal to couples, honeymooners and families. With dining venues, lifestyle establishments and tourist attractions peppered within and around the town, you won’t have to travel far to enjoy scrumptious beachfront dinners, shop for necessities at the local stores, browse through a lively night market or visit widely-known sites. It’s a destination that encourages relaxation, yet offers easy accessibility for dining out and sightseeing. Don’t know where to start? We’ve rounded up the must-sees, must-dos, must-eats and must-stays in town. Check out our travel guide below, and have fun exploring! 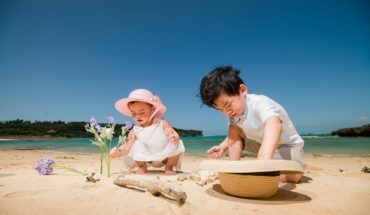 With a gently sloping, powdery white sand coast, plenty of activities and dining options to choose from and clean amenities, Choeng Mon Beach is a popular attraction among couples, honeymooners and families. Massage huts, restaurants and beach bungalows are scattered along the beachfront, lending the venue an inviting, personal feel. From the beach, you’re just a skip away from the high street, where you’ll easily find shops and local amenities. While the beach is suitable for swimming, beach-goers will need to exercise caution and keep a lookout for jet-skiers in the vicinity. Every Wednesday, the main road in town comes alive with a weekly night market. It’s the island’s smallest night market, so visitors won’t have to battle the crowds often found at the more popular walking streets of Mae Nam or Bophut. However, if exploring a vibrant, bustling walking street is right up your alley, Fisherman’s Village Walking Street is a great option. It’s just 17 minutes’ drive away from Choeng Mon Night Market. Thai massages, which incorporate acupressure, stretches and assisted yoga poses may not be the most relaxing of therapies – yet it never fails to leave one feeling stretched out and rejuvenated after. For a top-notch experience, head over to Six Senses Spa, where treatments take place in private venues overlooking a rock-fringed coast. Take your pick from a range of wellness therapies, massages (including treatments using Thai herbal compresses or hot stones) and energy therapies like Reiki and chakra balancing treatments. There’s also the option of enjoying in-villa massages – just let your villa manager know, and he or she will make the necessary arrangements. 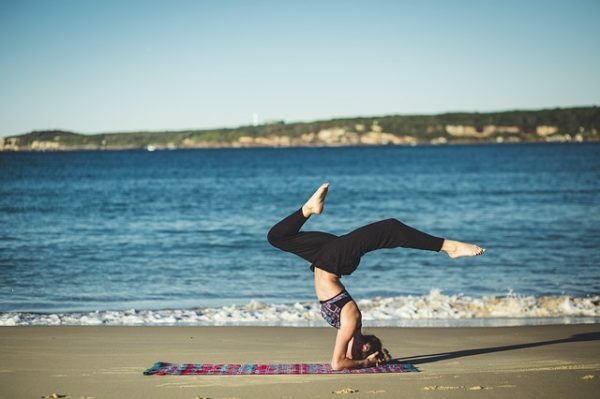 There’s something for every fitness enthusiast in Samui – whether you prefer nourishing, meditative exercises or something that’s fast-paced and action-packed. Start off your mornings on a rejuvenating note at The Yogarden Samui. Soak up its relaxed, serene vibes as you stretch out on the mat in an open-air yoga pavilion. The on-site Garden Cafe is a great place for fuelling up for a post-yoga, since the menu lists a variety of nutritious options, including smoothies, juices and vegetarian dishes. Or work up a sweat at Yodyut Muaythai Gym. Group and private training sessions are available here, and the venue stands out with its modern amenities, professional trainers and a spacious, airy setting. You’ll likely crave flavourful Thai food once you’re back home after your vacation – and instead of settling for unspectacular take-outs, why not whip up your favourite dishes using fresh ingredients and traditional cooking techniques? Island Organics is a good option if you’re looking for group classes. It’s a treat cooking in the well-appointed kitchen, and the course also involves a tour of the on-site eco-friendly farm and touches on eco-garden topics. Educational and interactive, it’s an activity that both kids and adults will enjoy. Alternatively, you may opt to have private cooking sessions conducted at your villa. From your villa, you’re easily within reach to Samui’s most famous landmark – the Big Buddha. Located within the compounds of Wat Phra Yai, the glittering, golden Buddha statue stands at a height of 12 metres and is visible from miles away. Ascend up the viewing platform for breathtaking views over the coastline. Come in the early evening to enjoy the spectacular sunset scenery; alternatively, visit during the morning to avoid the sweltering mid-day heat. While you’re in the vicinity, make a stop by at Wat Plai Laem. 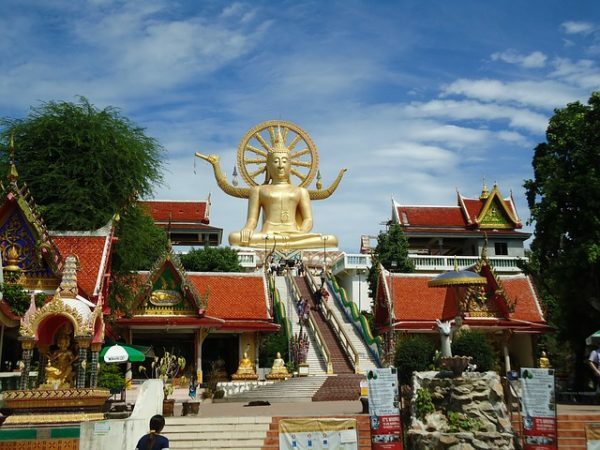 Located just a skip away from the Big Buddha, the temple complex boasts traditional Thai and Chinese design elements, eye-catching sculptures and a striking 18-arm Guanyin statue. 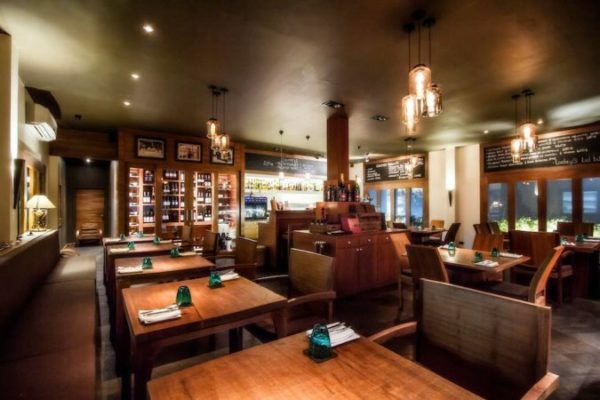 The Larder is a cosy and contemporary venue with a wood-dominated decor and a menu featuring European gourmet fare. Highlights include the Mussellini, a mussel and clam chowder with potatoes, Curried Away, a dish of curried lentils with a Scotch duck egg and the decadent Belly Legal – a dish of slow-cooked pork and sweet potato puree. 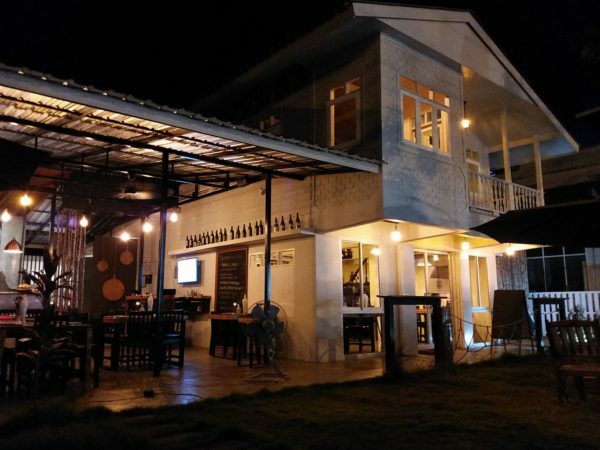 The Larder, 9/114 Moo 2 Thanon Chaweng-Choeng Mon, Ko Samui, p. +66 77 601 259. Open Mon-Sat 12pm – 10pm. Closed on Sun. 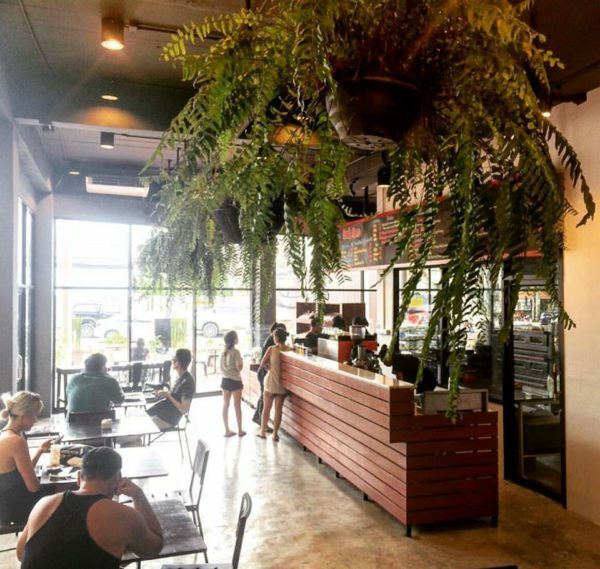 Without a doubt, Supattra Thai Dining dishes out some of the tastiest plates of Thai fare on the island; in fact, it’s so popular that you’re unlikely to get a table without making reservations in advance. The venue also boasts modern interiors, friendly service and a good selection of cocktails and wines. Supattra Thai Dining, 32/6 Moo 4 Sanam Bin Road, Bophut, Ko Samui, p. +66 93 282 8777. Open Tue-Sat 6pm – 11pm. Closed on Sun – Mon. Hankering for Italian fare? You can’t go wrong with dinner at Pepenero, where you’ll enjoy dishes like a starter of mozzarella and Parma ham, spaghetti with grilled tomatoes and Nduja sausages, braised lamb shank or homemade bigoli with Italian sausage ragu, red wine and fennel seeds. Each dish is lightly seasoned, so you can appreciate the fresh flavours of the ingredients. Beyond the food, what makes this family-run establishment stand out is its warm, personable service. 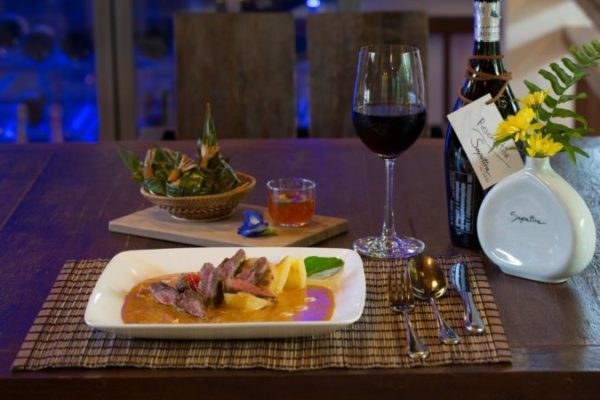 Pepenero, 59/17 Moo 6 Tambon, Bophut, Ko Samui, p. +66 77 963 353. Open Mon-Sat 6pm – 10pm. Closed on Sun. Like Pepenero, Salefino serves up sumptuous plates of Italian fare. What differs is the setting, as Salefino enjoys a prime beachfront location overlooking the sea. Salefino, 16/8 Moo 5, T. Bophut, Ko Samui, p. +66 91 825 2190. Open Mon-Fri 1pm – 9pm, Sat 5pm – 10:30pm. Closed on Sun. Pangaea’s the third (and final) Italian restaurant on our list. Located within the compounds of the Sala Hotel Resort, Pangaea’s laid back, quiet setting makes it an excellent option for intimate dining experiences. Recommended items include the wood-fired pizzas, blue cheese and pearl salad and a dessert of pear in red wine. Pangaea, Sala Samui Choengmon Beach Resort, 10/9 Moo 5, Bann Plai Laem, Ko Samui, p. +66-77-245-888. 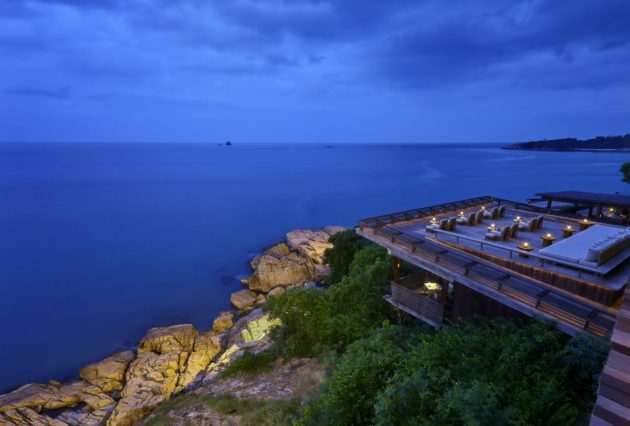 For an upscale dining experience, head to Dining on the Rocks, the signature restaurant at luxury resort Six Senses Samui. You’re guaranteed terrific sea views, whether you’re seated at the open-sided dining room, or out at a spacious terrace built on the rocks. The menu features fusion cuisine, with an emphasis placed on sustainable and organic produce. There’s a good variety of menus to choose from, and ala carte, vegan and vegetarian options are also available. Round out your meal with a nightcap at the on-site bar. 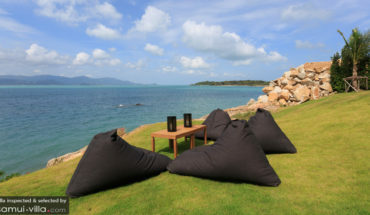 Dining on the Rocks, Six Senses Samui, 9/10 Moo 5, Baan Plai Laem, Bophut, Ko Samui, p. +66 77 245 678. Open 5pm – 10pm daily. 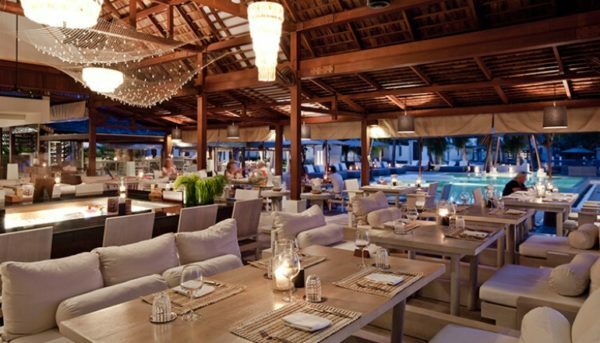 SALA Samui Restaurant offers a date-worthy experience with its prime beachfront location, elegant setting and attentive service. 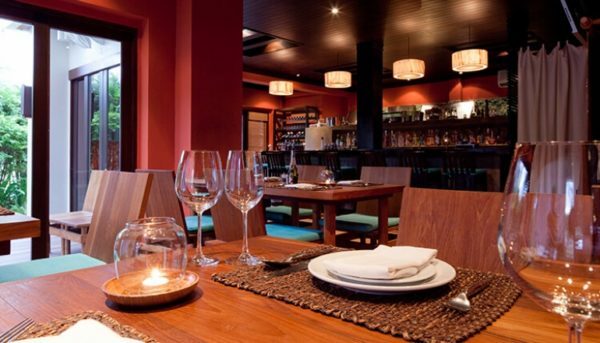 The menu features Thai and international fare, as well as a comprehensive wine selection. SALA Samui Restaurant, Sala Samui Choengmon Beach Resort, 10/9 Moo 5, Bann Plai Laem, Ko Samui, p. +66-77-245-888. Just as its name suggests, the Big Buddha Coffee Shop is located just next to the Big Buddha. It’s a great place for a stopover when you’re out sightseeing in the vicinity – try out the cafe’s excellent coffees or smoothies and soak up the breezy vibes and coastal scenery. The Big Buddha Coffee Shop, Big Buddha Temple, Ko Samui, p. +66 89 027 3827. Open Mon-Sat, 8:30am – 4pm. Clyde Cafe and Bakery is our favourite haunt for European cafe fare. The cosy, airy setting is hard to beat, and while the menu isn’t extensive, you’ll still find a reasonable selection of homemade bread and pastries, breakfast mains, juices, coffees and cold cuts and cheese platters available. Meat lovers shouldn’t miss out on the main draw here: the Panang pulled pork burger. 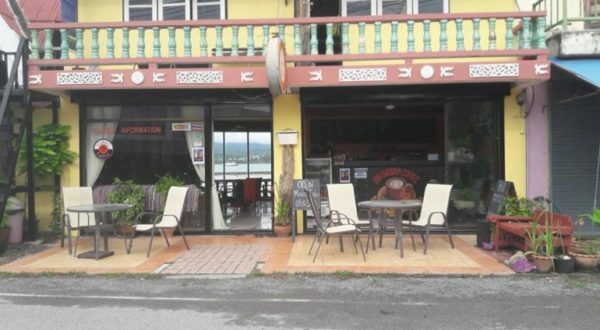 Clyde Cafe and Bakery, 162/149 Moo 2, Chaweng – Choengmon Road, Bophut, Ko Samui, p. +66 77 601 402. Open 9am – 8pm daily. Part boutique and part cafe, Aroma offers an inviting, relaxed setting brightened up with bright pops of purple. The menu features paninis, salads, Thai dishes, desserts and a much raved-about selection of Italian coffees. There’s also a collection of locally designed scarfs, candles and bags to browse through if you’re hunting for souvenirs. 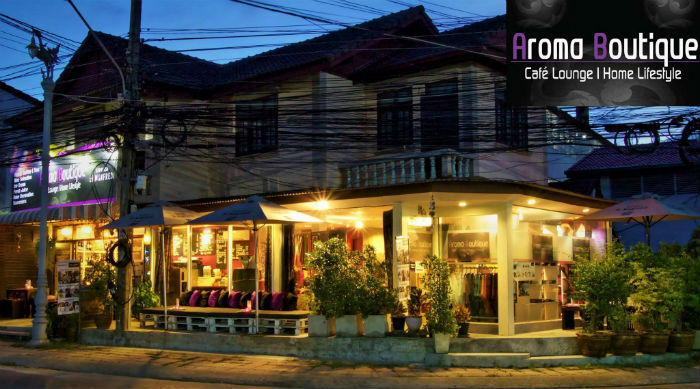 Aroma Boutique Cafe, 24/53 Moo 5, Choeng Mon, Ko Samui, p. +66 85 230 2089. Open 9am – 10pm daily. 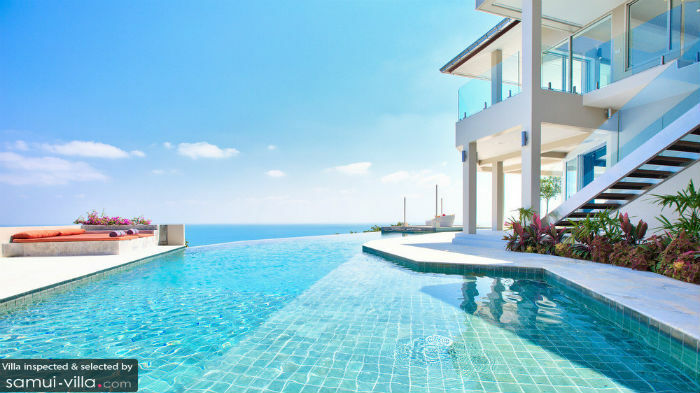 Featuring a spacious, sparkling infinity pool, uninterrupted sea vistas and a well-manicured garden, Baan Bon Khao is a property that checks off all the right boxes as a luxury retreat. The interiors are modern and elegant, with a limited palette featuring mainly whites and neutrals – a great choice, since it further draws attention to the villa’s postcard-perfect surroundings. Highlights include an entertainment room with a billiard table, a breezy alfresco dining area and sunshine-drenched terrace. A total of 12 guests are comfortably accommodated in six bedrooms. 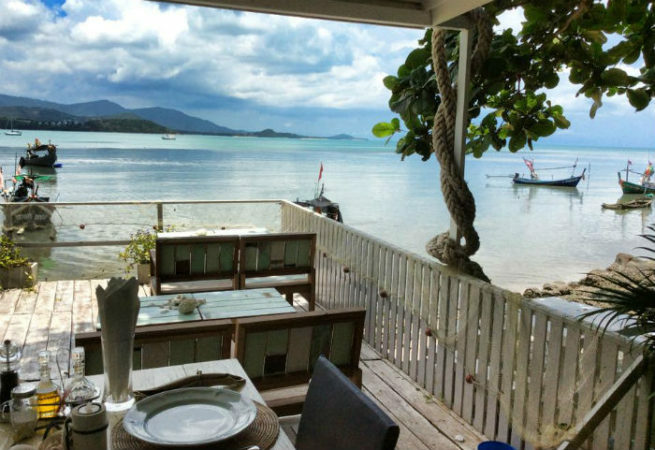 Baan Bon Khao is about 10 minutes’ drive away from Choeng Mon Beach. Other nearby attractions include the iconic Big Buddha (10 minutes’ drive), Wat Plai Laem (seven minutes’ drive), Choeng Mon Night Market (five minutes’ drive) and Fisherman’s Village (15 minutes’ drive). 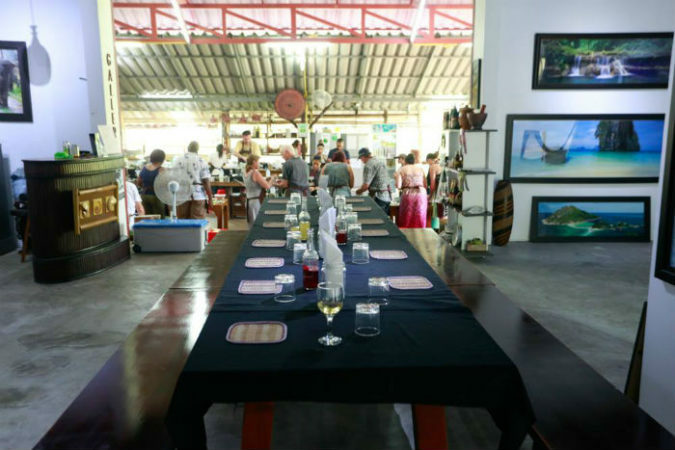 There’re heaps of restaurants and bars to choose from, including seafront options along Choeng Mon Beach, as well as a range of upscale dining establishments at Fisherman’s Village. Motsamot Villa is a great bet for vacationers who appreciate properties with traditional Thai design elements and a cosy, inviting vibe. Spread out across beautifully landscaped grounds, the living pavilions feature Thai-style roofs, wood-clad interiors and Asian accents. With two living areas, two kitchens and three dining areas, guests are guaranteed plenty of space for mingling in groups or unwinding quietly. The villa accommodates 10 guests in five bedrooms. 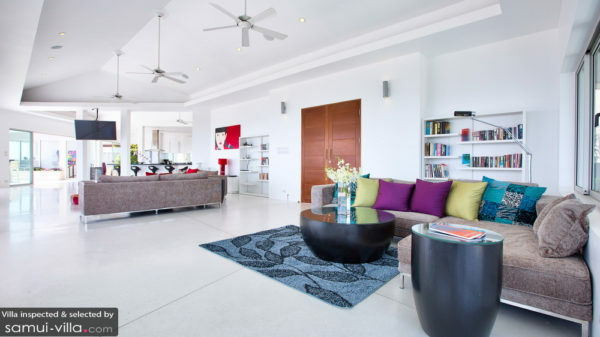 Motsamot Villa is five minutes’ drive from Choeng Mon Beach. You’ll enjoy easy access to key cultural attractions like the Big Buddha and Wat Plai Laem, as well as Choeng Mon Night Market, Fisherman’s Village, yoga studios and Muay Thai training camps. Choeng Mon Beach offers excellent beachfront dining options, and you’ll also find a good variety of high-end restaurants and bars at Fisherman’s Village in Bophut. The aesthetics are absolutely on point at Villa Akasha. 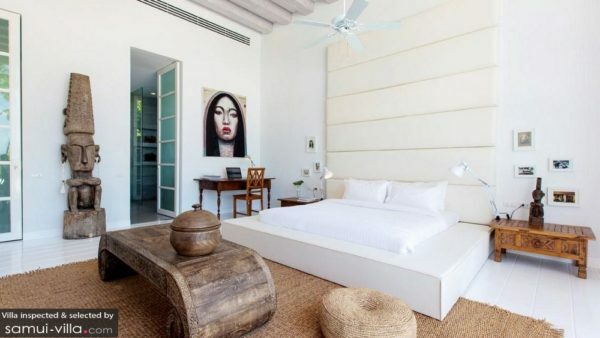 Striking art pieces stand out against an all-white setting, and a tasteful selection of clean-lined furnishings in neutral tones and ornaments made of natural materials add to the earthy vibe within. Outdoors, the turquoise pool glimmers under the sun, surrounded by a spacious poolside area with a shaded seating area, water feature and views over the swaying palms and rugged coastline. Ideal for smaller groups, Villa Akasha accommodates six guests in three bedrooms. 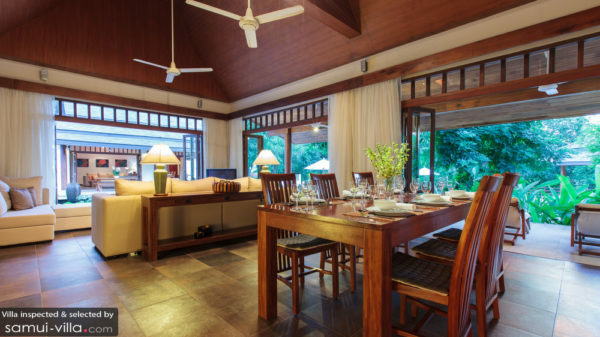 Villa Akasha is about five minutes’ drive from Choeng Mon Beach. Guests will also enjoy easy access to key cultural attractions, beachfront restaurants, upscale lifestyle establishments, spas and yoga studios. 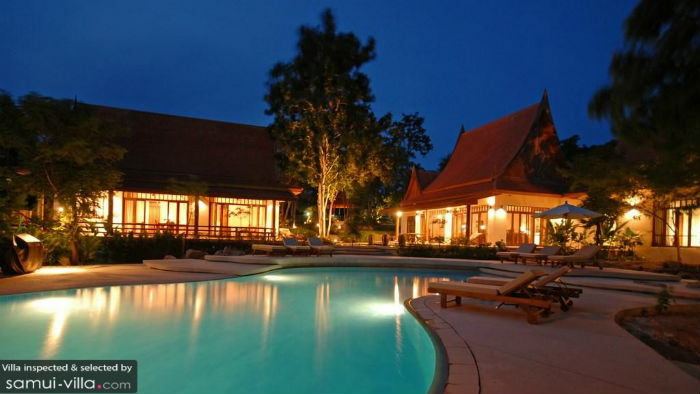 See our villas in Choeng Mon. Inspected and selected by Villa-Finder.com.